Flourite Dark is a specially fracted stable porous clay gravel for the natural planted aquarium. Its appearance is best suited to planted aquaria, but may be used in any freshwater aquarium environment. Flourite Dark is most effective when used alone as an integral substrate bed, but it may be mixed with other gravels. Gravel modifiers such as laterite are not necessary. Flourite Dark is not chemically coated or treated and will not alter the pH of the water. Flourite Dark is good for the life of the aquarium and need not be replaced. To determine the number of bags required for your aquarium, please note that each bag (7 kg, 15.4 lbs) occupies a volume of approximately 5,500 cm3 (325 cu. in.). To determine your desired volume multiply tank width by length by desired depth. Although it is pre-washed, because Flourite Dark is a natural product, it may become dusty in transit and require rinsing before use to remove any residual dust. 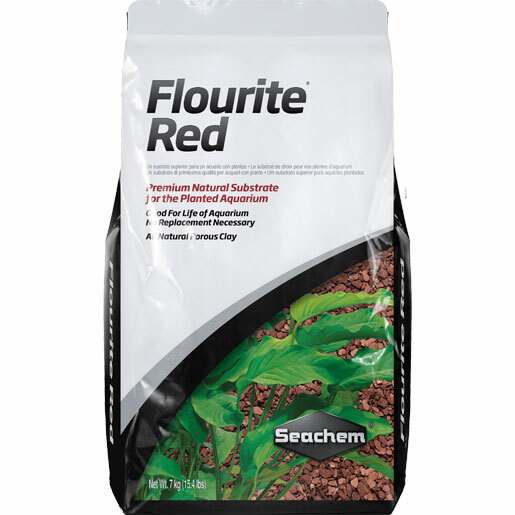 Flourite Red is a specially fracted stable porous clay gravel for the natural planted aquarium. Its appearance is best suited to planted aquaria, but may be used in any freshwater aquarium environment. Flourite Red is most effective when used alone as an integral substrate bed, but it may be mixed with other gravels. Gravel modifiers such as laterite are not necessary. Flourite Red is not chemically coated or treated and will not alter the pH of the water. Flourite Red is good for the life of the aquarium and need not be replaced. To determine the number of bags required for your aquarium, please note that each bag (7 kg, 15.4 lbs) occupies a volume of approximately 7,000 cm3 (425 cu. in.). To determine your desired volume multiply tank width by length by desired depth. This bag is sufficient for about a 5 cm (2 inch) deep bed in a typical 40 L (10 gallon) tank. Although it is pre-washed, because Flourite Red is a natural product, it may become dusty in transit and require rinsing before use to remove any residual dust. Flourite Black is a specially fracted stable porous clay gravel for the natural planted aquarium. Its appearance is best suited to planted aquaria, but may be used in any freshwater aquarium environment. Flourite Black is most effective when used alone as an integral substrate bed, but it may be mixed with other gravels. Gravel modifiers such as laterite are not necessary. Flourite Black is not chemically coated or treated and will not alter the pH of the water. Flourite Black is good for the life of the aquarium and need not be replaced. Although it is pre-washed, because Flourite Black is a natural product, it may become dusty in transit and require rinsing before use to remove any residual dust. 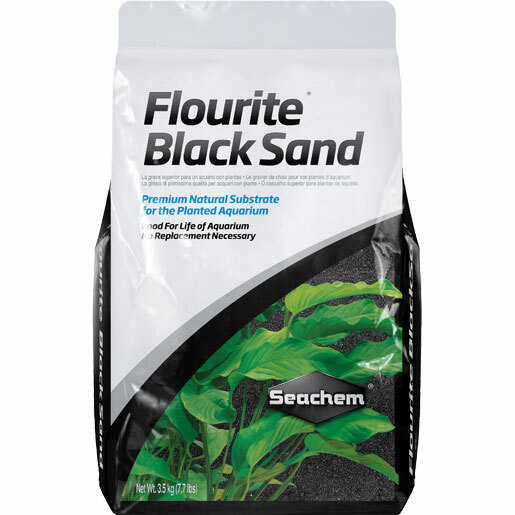 Flourite Black Sand is a specially fracted stable porous clay gravel for the natural planted aquarium. Its appearance is best suited to planted aquaria, but may be used in any freshwater aquarium environment. Flourite Black Sand is most effective when used alone as an integral substrate bed, but it may be mixed with other gravels. Gravel modifiers such as laterite are not necessary. Flourite Black Sand is not chemically coated or treated and will not alter the pH of the water. Flourite Black Sand is good for the life of the aquarium and need not be replaced. To determine the number of bags required for your aquarium, please note that each bag (7 kg, 15.4 lbs) occupies a volume of approximately 5,500 cm3 (320 cu. in.). To determine your desired volume multiply tank width by length by desired depth. Although it is pre-washed, because Flourite Black Sand is a natural product, it may become dusty in transit and require rinsing before use to remove any residual dust. 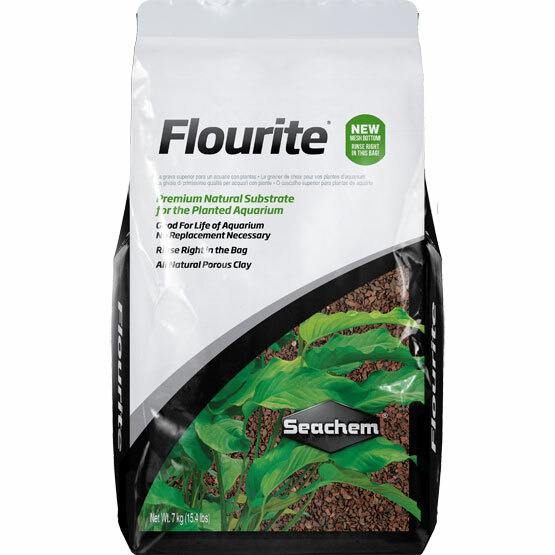 Flourite is a specially fracted stable porous clay gravel for the natural planted aquarium. Its appearance is best suited to planted aquaria, but may be used in any freshwater aquarium environment. Flourite is most effective when used alone as an integral substrate bed, but it may be mixed with other gravels. Gravel modifiers such as laterite are not necessary. Flourite is not chemically coated or treated and will not alter the pH of the water. Flourite is good for the life of the aquarium and need not be replaced. Although it is pre-washed, because Flourite is a natural product, it may become dusty in transit and require rinsing before use to remove any residual dust. Onyx Sand is a naturally dark gray sand that perfectly complements and enhances the appearance of any aquarium. It provides not only iron and other minerals but supports optimal KH levels for freshwater planted aquariums. 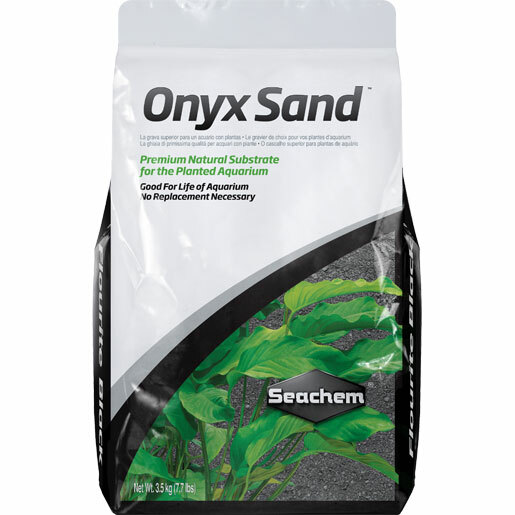 Being carbonate rich, Onyx Sand provides an advantage to any plants able to utilize bicarbonates. Although ideally suited to planted aquaria, it may be used in any aquarium environment. Onyx Sand is most effective when used alone as an integral substrate bed, but it may be mixed with other gravels. Gravel modifiers such as laterite are not necessary. Onyx Sand is not chemically coated or treated but does have a slight buffering capacity that may raise pH by 0.1 - 0.5 pH units (depending on source water characteristics). Onyx Sand is good for the life of the aquarium and need not be replaced. To determine the number of bags required for your aquarium, please note that each bag (7 kg, 15.4 lbs) occupies a volume of approximately 4,250 cm3 (260 cu. in.). To determine your desired volume multiply tank width by length by desired depth. This bag is sufficient for about a 3.5 cm (1.5 inch) deep bed in a typical 40 L (10 US gallon) tank. Although it is pre-washed, because Onyx Sand is a natural product, it may become dusty in transit and require rinsing before use to remove any residual dust.